"Took photo from cruise ship balcony. No UFO image when photo taken. Saw images on iPhone afterwards." 1 - I was on the Royal Caribbean Mariner of the seas. We were in blue water and a day away from docking at Nassau. I took this photo on December 4, 2018 at 5:18pm (according to my phone's documentation), from ship's balcony. The two unknown captures (one appears structural and the other appears to be light shining on water but not as a beam) were not in view when I took the photo. I noticed the images days later at home when reviewing my cruise photos. 2 - Noticed object when I looked at my photos after my vacation; we were out on the ocean with nothing seen while taking photo other than the beautiful sunset and clouds. 3 - A buoy? 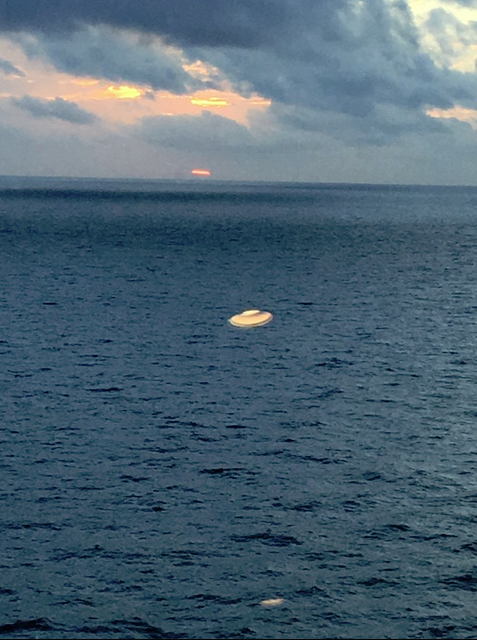 definitely not a buoy... object appeared to be above water. 4 - Since I didn't observe it while taking the photo, I cannot state its actions or motions. 5 - After seeing the photo, it looked very unusual to me. I felt intrigued: Asked others what they thought it could be. Some thought it was something in the water, but I think it is hovering with light shining down onto the water. 6 - I repeat, I Never saw this sight, only noticed after I was home from my vacation viewing my cruise photos. BEAMS Comment: Firstly it should be stated, that we are in no doubt of the authenticity of our featured image... it is absolutely genuine; the question is, just what does it show? 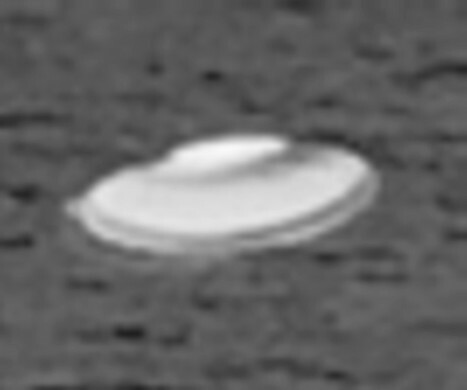 We tried comparing a reduced size of the image of the UFO above the reflection in the sea (without any alteration to it’s angle – only a reduction in it’s size) and put it alongside the reflection on the wave. The comparison shows that it is at the same angle as that of the UFO above it, therefore would assume this is good evidence that the image is the reflection. Assuming that the height that the photo was taken at above the water must have been something like 80 ft +. We're thinking that the reflection in the sea is from the underside of the UFO hovering above, formed by the Sun’s last ray’s, (sky & cloud reflected light) hitting the surface of the sea, light from the seas surface then being reflected back upwards onto the underside of the UFO, (the UFO being at a tilt) and as the photograph of the UFO is obviously viewed from above, (which puts it hovering at something over 40 ft above the sea) then reflecting down and catching the surface of the wave, makes sense. Of course, initially, we thought this anomaly might simply be an internal reflection after the image had been taken through a window, but it is not; after close examination it is clear that, just as the witness stated, they were outside on the ship's balcony when taking their photos. We also considered the possibility that this UFO was caused by strong sunlight hitting the camera lens, yet we think that idea is called into question in this particular case; we've scrutinized and dismissed countless lens flare images in our time, but this shot doesn't fit in with anything we have come across in that category before. The object here appears 3 dimensional; it has definite geometry... 'structure', plus, it would seem, that its glow is even reflecting in the water! 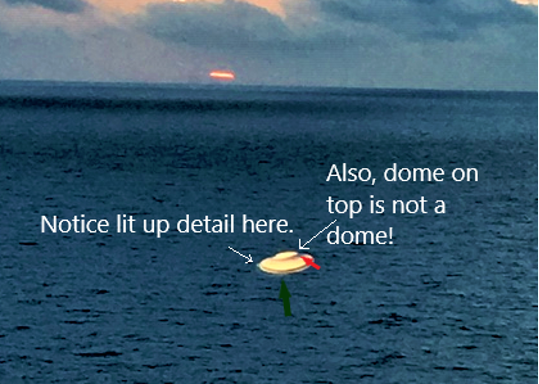 In addition, we have had a much closer look at the left side detail of the UFO, and remarkably, there appears to be a small attached part to it; as you’ll notice, there is no other lit area/or reflection captured in the photo on the surface of the sea. (apart from the actual UFO’s own reflection). Also, the domed part on top is not perfectly spherical as it does at first appear to be; this I’ve highlighted with a red arrow on the under-shadowed area to the right of the deceptively non-elliptic top. Notice also, where I’ve inset a green arrow, at the lowest edge at the front of the UFO nearest to the sea, that is where there is blurring/fuzziness in the image. I don’t fully understand why this should be, as if it’s the nearest part in shot then it should also be the sharpest in detail, and it isn’t? Regarding this somewhat blurred front edge... we wonder if it could be the water running off of the front area of the disc causing the blurring? Overall Verdict: A good 70/30 in favour; in our opinion, this photo cannot be readily dismissed. We might add, that if by some outside chance this object IS simply an aberration caused by the sun affecting the iPhone's optics, a digital artifact as it were, (which we are not, by any stretch of the imagination, convinced that it is) then it doesn't say much for iPhones, and maybe most other so-called 'Smartphones does it? when it comes to the trustworthiness of these 'handy' little devices. If that turned out to be the case, then we can only fall back on our adage, you can't beat a good old DSLR... they are a far more faithful tool when it comes to our subject.... even when a capture is inadvertent.